Starting pitcher Dan Haren #24 of the Los Angeles Angels of Anaheim tosses the ball to first to get Billy Butler of the Kansas City Royals out in the sixth inning at Kauffman Stadium on September 16, 2012 in Kansas City, Missouri. 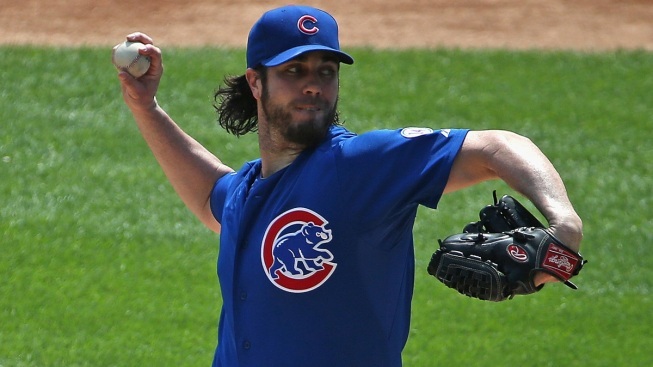 A person familiar with the deal says the Los Angeles Angels have agreed to trade pitcher Dan Haren to the Chicago Cubs for closer Carlos Marmol. The person spoke to The Associated Press on Friday night on condition of anonymity because the deal had not been completed yet. The deal was first reported by the Chicago Sun-Times. A spokesman for the Cubs declined to comment. Marmol's contract gives him the right to submit a list of up to five teams he can't be traded to without his consent. Haren, a three-time All-Star from 2007-09, would be the second starting pitcher traded by the busy Angels in three days. Los Angeles shipped Ervin Santana to the Kansas City Royals on Wednesday for minor league left-hander Brandon Sisk.